"I'm so glad you're here! We've got a lot to talk about… So much to celebrate tonight." Drafthouse Films has unveiled a new trailer for Karyn Kusama's creepy horror-thriller The Invitation, about a dinner party that isn't exactly what it seems. The cast includes Michiel Huisman, John Carroll Lynch, Emayatzy Corinealdi, Tammy Blanchard, Mike Doyle and Lindsay Burdge. Following up the first teaser, this trailer finally gives us more of a look at what's waiting these guests of the party. "Don't tell me that this is normal!" There's some really eerie, unsettling stuff going on and the reviews seem to indicate it's wild. Rob Hunter from FSR says: "In addition to being a suspenseful and well-acted ride the film also looks fantastic." Will and Eden were once a loving couple. After a tragedy took their son, Eden disappeared. Two years later, out of the blue, she returns with a new husband… and as a different person, eerily changed and eager to reunite with her ex and those she left behind. Over the course of a dinner party in the house that was once his, the haunted Will is gripped by mounting evidence that Eden and her new friends have a mysterious and terrifying agenda. But can we trust Will's hold on reality? Or will he be the unwitting catalyst of the doom he senses? The Invitation is directed by filmmaker Karyn Kusama (Girlfight, Aeon Flux, Jennifer's Body), from a screenplay by Phil Hay & Matt Manfredi. This first premiered at last year's SXSW Film Festival. 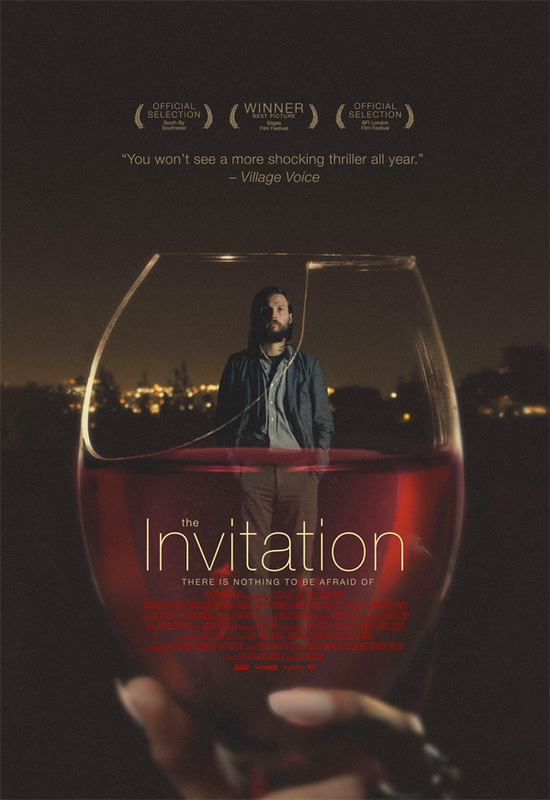 Drafthouse Films will release The Invitation in select theaters starting March 25th. Thanks for posting. That looks unsettling. I'll keep an eye out for this. Most trailers give it all away. It's great to see a trailer that doesn't give anything away. On my list of must-sees. Looks like they'll keep you guessing if it's all in his head or not throughout most of the movie (or at least the first half)... intriguing. I hope that it's not just about the reveal, and that there's more to the film, though. This looks great! I love the poster too!